Nestled in the central eastern coastal region of Italy known as “Le Marche”, Azienda Agroforestale FONTEZOPPA is located in the outskirt of Civitanova, a commune facing the Adriatic Sea, about 46 kilometers southwest of Ancona and about 52 kilometers east of Serrapetrona. The owner/winemaker Giovanni Basso, benefiting from 20 years of experience as a grower, continues to produce harmonious, earthy wines of traditional character with the upmost respect for the environment. The vineyards are located in the hilly province of Macerata, some on the hills’ slopes surrounding the town of Serrapetrona, a stone throw from San Severino, and some close to Civitanova, both areas considered to be some of the best spots to grow grapes in the Marche region. The 25-year-old vines grow between 500-600 meters above sea level, benefiting from the cool sea breeze of the nearby Adriatic Sea, resulting in great balance and freshness, even for the reds. Fontezoppa vineyards are planted with classic grapes like Sangiovese, Merlot and Cabernet Sauvignon, but also more indigenous grapes like Lacrima, Maceratino, Incrocio Bruni (a rare crossing of Verdicchio and Sauvignon) and Pecorino. Fontezoppa produces about 15 different wines and a grappa. The 4 wines available in New York (through SoilAir Selection) are crafted mainly with Verdicchio for the white and predominantly with Sangiovese complemented by Cabernet Sauvignon and Merlot for the reds. Verdicchio di Matelica: a clean, refreshing and versatile white made of 100% Verdicchio grapes vinified in stainless steel tank white. Marche Rosso I.G.T: a juicy red made of 40% Sangiovese, 40% Cabernet Sauvignon and 20% Merlot from younger vines, also vinified in stainless steel tank. “Falcotto” from Serrapetrona appellation: a great, full-bodied, earthy and spicy red made from the rather undiscovered Vernaccia Nera grape variety, a sibling of the more popular Vernaccia white. Vernaccia Nera is mainly planted in the Serrapetrona appellation where it is also used to produce sparkling red wines and Trentino-Alto Adige/Südtirol region where the resulting reds are light, earthy, spicy and mineral. 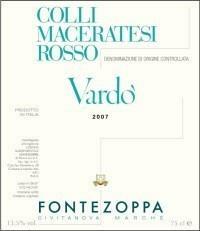 The vineyards used for “Vardo” are located in the Colli Maceratesi, a Denominazione di origine Controllata (DOC) producing some white wines under “Colli Maceratesi Bianco”, which comprise at least 80% of the Maceratino grape (also known as Montecchiese) with the remaining 20% from Trebbiano Toscano, Verdicchio, Malvasia and Chardonnay. Also some red wines under “Colli Maceratesi Rosso”, which must comprise at least 50% of the Sangiovese grape with the remaining 50% from Cabernet Franc, Cabernet Sauvignon, Ciliegiolo, Lacrima Merlot and Montepulciano. Vardo` is a blend of 60% Sangiovese and 40% Cabernet Sauvignon as the label indicates it; although the winery website says differently, 30% Cabernet Sauvignon and 10% Merlot, which I wouldn’t be surprised if the later corresponds to the real blend. The grapes were carefully harvested from vineyards consisting of 8 years old vines planted at about 150 meters above sea level, with North Eastern exposure to the sun. The fermentation occurred in stainless steel tank, where the wine also spent a resting period of 3 months, followed by a maturation period of 12 months in big 60 hectoliters used French oak casks to confer more complexity and structure to the wine without imparting the taste with too much toasted oak flavors. Then it was bottled with no filtration or fining to keep its texture and maximize the quality by preserving all essential components. A blend of roughly 60% Sangiovese and 40% Cabernet Sauvignon from 25 years old vines, 2007 Fontezoppa Vardo` Colli Maceratesi Rosso shows a beautiful, bright ruby-garnet color of light to medium intensity, with slight mature brown prune reflects on the rime. Although quite expressive, the nose is moderately complex, offering enjoyable, yet dry earthy aromas of dark berries, spices and black fruits intermingled with hints of smoke, black earth, pencil shaving, graphite and other minerals. Light to medium bodied, the palate is rather dry, very earthy, mineral and crisp, characterized by intense, dry fruity spicy flavors and black fruit. Very well balanced, the palate is full yet not heavy, fairly complex and persistent with vegetal, slightly herbaceous notes mixed with dry earth and juicy black fruits. From the beginning, the acidity and the mineral procure focus, while the soft and supple tannins provide a tamed structure all along towards the lengthy peppery and herbal, spicy finish. Definitely a food wine enhanced by its acidity and minerality, complemented by a lot of earthy components and spices. Decanting is highly recommended, and in my opinion the wine was even showing better the next day, it appeared more settled and put together. Drink it with earthy dishes like game, poultry and venison; also some aged cheeses. I love it. A steal under $15, for connoisseurs and amateurs of more cerebral wines, like me.